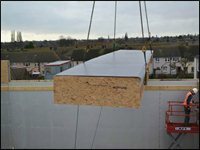 IKO Armourdek is a ‘Zero-Waste’, offsite manufactured long spanning composite roof panel, factory finished with IKO’s Single-Ply Roofing Membrane which contributes significantly to reduced programmes & construction time on site. With exceptional thermal & acoustic properties and single span capabilities up to 12m, this innovative composite roof panel provides a high performance, fast-track modern method of construction. 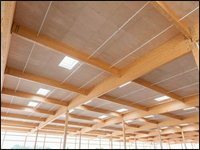 Installation rates can be as high as 1,000m2 per day thanks to the large panel sizes up to 12m x 4m. This saves a considerable amount of time when compared with the installation methods of other roofing systems. Armourdek Composite Roof Panel can also have a positive impact in helping to reduce main contractor prelims and overall build costs due to the fast-track nature and single spanning capabilities of this roofing system. Some of the benefits are listed below. If you want to find out more about the excellent benefits or technical specifications of Armourdek, please email Kevin Bowsher on kevin.bowsher@iko.com or ring him on 07793 577011.